The inner diameter of the tire must match the rim bead seat diameter. For instance, a tire size 37-622 fits on a 622 x 19C rim. Furthermore, the tire width must match the rim width. 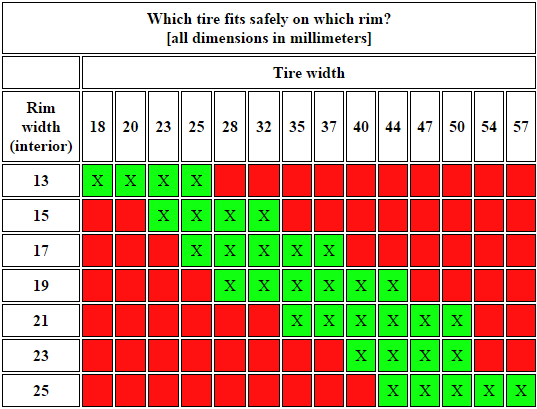 The following table shows possible combinations of tire widths and rim widths according to ETRTO. There are many additional combinations which are not listed in this table, but nevertheless, work out in practice very well. It goes without saying that you ride with these combinations at your own risk. Unfortunately, the ETRTO standard in reality often lags behind. For example, very wide rims become more and more popular these days. The usage of wider rims also makes sense, because they support the tire’s stability. You can reduce the inflation pressure, before the riding behavior becomes spongy.